By <?xml:namespace prefix = st1 ns = "urn:schemas-microsoft-com:office:smarttags" />Wendell Dawson, Editor, AVOC, Inc. It is fitting that Coretta Scott King be honored by the state where she lived. Some media reports will dwell on the Lester Maddox History in Georgia. Generally, Georgia was not engulfed with the racial killings and strife of other Southern States. We had many Governors unlike Lester Maddox: Ernest Vandiver, Carl Sanders, Jimmy Carter, George Busbee et al who were responsible and led Georgia through those difficult times. Most Georgians of today have respect and the highest regard for Mrs. King. Her grace and class made her someone to be proud of. 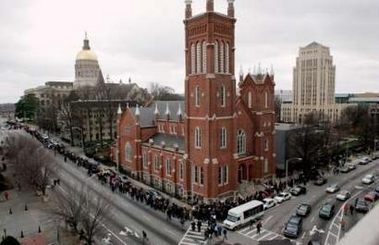 ATLANTA -- Thousands of mourners poured into the Georgia Capitol Rotunda yesterday to pay tribute to Coretta Scott King, the first woman and the first black person to lie in honor in what once was a seat of segregation. 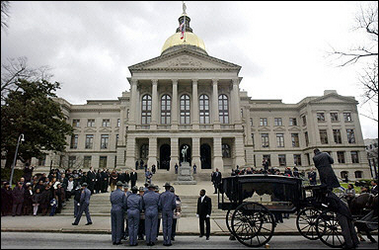 The bronze casket carrying the widow of Martin Luther King was carried through the streets of Atlanta on a horse-drawn carriage before being ushered into the Capitol by an honor guard of the Georgia State Patrol. The crowd outside cheered and threw roses as the casket went by. A lone bagpiper played "Amazing Grace" as Gov. Sonny Perdue and his wife, Mary, escorted the casket into the Statehouse -- a sharp contrast to the official snub afforded King nearly four decades ago by segregationist Gov. Lester Maddox. "Coretta Scott King was a gracious and courageous woman, an inspiration to millions and one of the most influential civil rights leaders of our time," Mr. Perdue said during a brief ceremony. "She was absolutely an anchor and support for her husband." Mrs. King's four children -- Yolanda, Dexter, Martin Luther King III and Bernice -- spent a few minutes at the open casket before the doors were opened to the public. Yolanda King stroked her mother's face. "While we claim her, she was their momma," Mr. Perdue said of the King children. "It's hard to give up your momma." Mrs. King, the "first lady of the civil rights movement," died Monday at 78. Atlanta Mayor Shirley Franklin, the first black woman to lead the city, said she owed her career to Mrs. King. "I would not be here without her," she said. ….But immediately after Mrs. King died, the state flag she helped to change -- no longer bearing the Confederate battle emblem -- was ordered lowered by Mr. Perdue……. The White House announced yesterday that President Bush will attend the funeral with the first lady and is expected to make remarks during the service. ATLANTA — Thousands of mourners poured into the Georgia Capitol Rotunda on Saturday to pay tribute to Coretta Scott King, the first woman and the first black person to lie in honor in what once was once a seat of segregation. 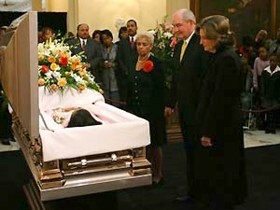 The bronze casket carrying the widow of the Rev. Marin Luther King, Jr. was carried through the streets of Atlanta on a horse-drawn carriage before being ushered into the Capitol by an honor guard of the Georgia State Patrol. The crowd outside cheered and threw roses as the casket went by. A lone bagpiper played “Amazing Grace” as Gov. Sonny Perdue and his wife Mary escorted the casket into the statehouse, a sharp contrast to the official snub afforded Martin Luther King Jr. nearly four decades ago by segregationist Gov. Lester Maddox. "Coretta Scott King was a gracious and courageous woman, an inspiration to millions and one of the most influential civil rights leaders of our time," Perdue said during a brief ceremony. "She was absolutely an anchor and support for her husband." King's four children — Yolanda, Dexter, Martin Luther King III and Bernice — spent a few minutes at the open casket before the doors were thrown open to the public. Yolanda King stroked her mother's face, and she and her sister Bernice wiped away tears. "While we claim her, she was their momma," Perdue said of the King children. "It's hard to give up your momma." King, the "first lady of the civil rights movement," died Monday at the age of 78. A soloist sang the hymn "Blessed Assurance" which echoed in the cavernous marble hall. Atlanta Mayor Shirley Franklin, the first black woman to lead the city, said she owed her career to King. "I would not be here without her," Franklin said. Outside, thousands of mourners, some pushing strollers and others leaning on walkers, waited hours in windy, chilly weather to pay their respects. "She's worth it," Atlanta resident Janann Ransom said. "She stood in line for me, her and her husband, when I couldn't stand in line." Raymond Dutrieuille, of Duluth, Ga., came with his wife, Nena, and 2-year-old son Raylin, "to experience part of history." State Rep. Randal Mangham said it was high time a King was able to lie in honor under the Georgia state dome. "Martin is here today with her," Mangham said. "She finished the work that he began." In 1968, then-Gov. Maddox ignored Martin Luther King Jr.'s death and refused to authorize a public tribute. He was outraged at the idea of state flags, then dominated by the Confederate Cross, flying at half-staff in tribute to a black man. But immediately after Coretta Scott King died, the state flag she helped to change — no longer bearing the Confederate battle emblem — was ordered lowered by Perdue. Coretta Scott King died in Mexico at an alternative medicine clinic, where doctors said she was battling advanced ovarian cancer. She also had been recovering from a serious stroke and heart attack. In January, she made her first public appearance in a year on the eve of her late husband's birthday. For most of Monday, King's casket will lie in Ebenezer Baptist Church, where her husband preached in the years before his death. Her funeral will be held at New Birth Missionary Baptist Church in Lithonia, where the Kings' youngest child, Bernice, is a minister. Few details had been released about the funeral, including who will deliver the eulogy. President Bush, who will attend the service with the first lady, is expected to make remarks during the service, according to the White House.